These are the kind of articles that keep me up at night. Whittling down a list of Colorado’s best day hikes to a mere twenty is a daunting task. There are literally hundreds of hikes that would fit the bill, and none of them would be wrong. If that comes off like a big, fat, humblebrag, well it is. The wealth of quality hiking adventures in Colorado is nearly limitless. Some hikes offer instant glory right from the parking lot (such as Brainard Lake in the Indian Peaks) while others take liberty with the definition of “day” hike, (such as the 16+ miles to Storm King Peak in the Grenadier Range, possible to knock out in a single day by strong hikers). 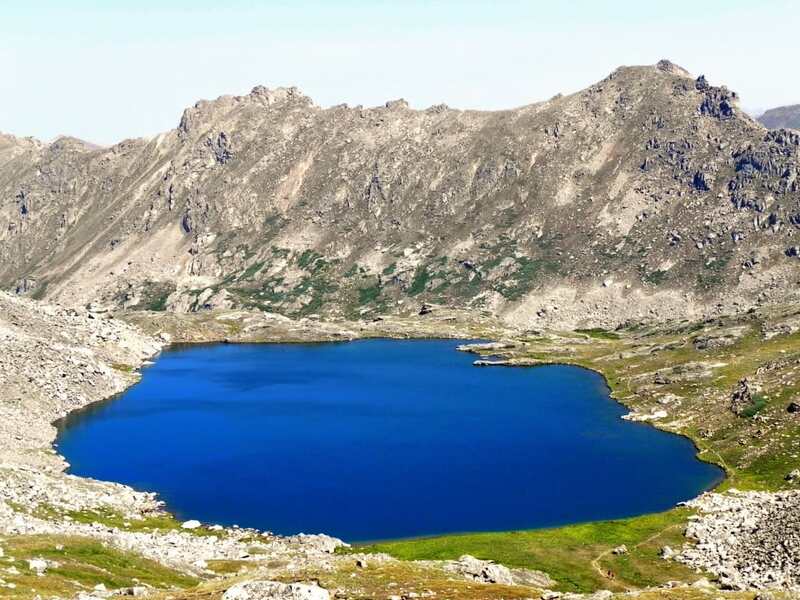 What makes a hike great is in the eye of beholder, but this collection of adventures is a worthy compilation that showcases the best natural settings in Colorado: towering mountains, crystal-clear alpine lakes, jagged rock faces, expansive views, and good wildlife sighting potential. A personal preference for longer days out (between 4 - 8 hours) is reflected in many of these adventures. With that in mind, these hikes offer a variety of wilderness environments across the state and range from simple on-trail walks to difficult—yet non-technical—scrambling (assuming the seasonal conditions are free of ice and snow). Please feel free to add some of your own favorites not listed here in the comments! Let’s get the obvious out of the way. 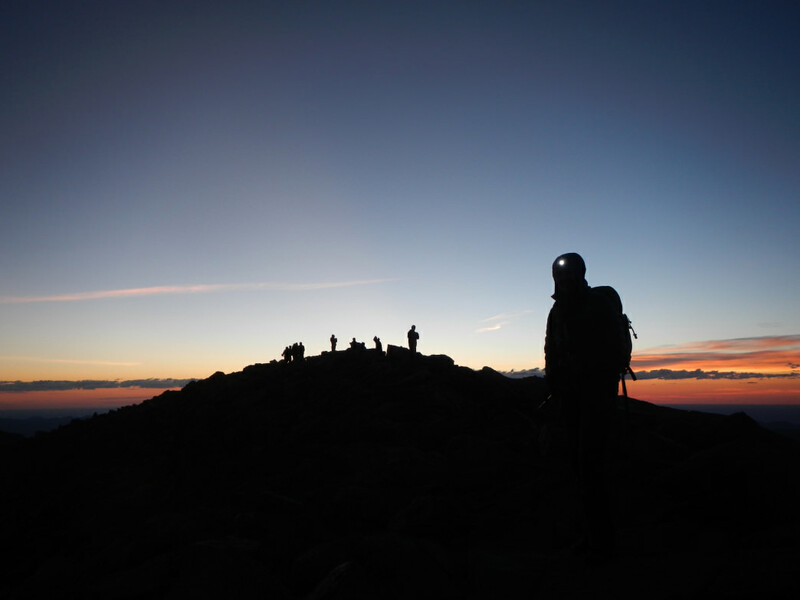 At 14,255 feet, Longs Peak is the 13th highest mountain in the state and one of the most visited peaks with a notoriously elusive summit. The National Park Service estimates about 15,000 people attempt to get to the top of Longs each year, with only 50% of them actually reaching the highest point. The 15-mile roundtrip, 5,000+ feet of elevation gain, thrilling exposure, and unpredictable weather add up to create a mountain whose mood can welcome or thwart even the most experienced hikers. Passing through the Keyhole itself is like shifting worlds into a mountainous kingdom hidden from sight during the 5.5 mile approach through forests and boulder fields. The trail is well-marked and can be crowded on summer weekends, but Longs nevertheless delivers on the promise of incredible views and worthy terrain. 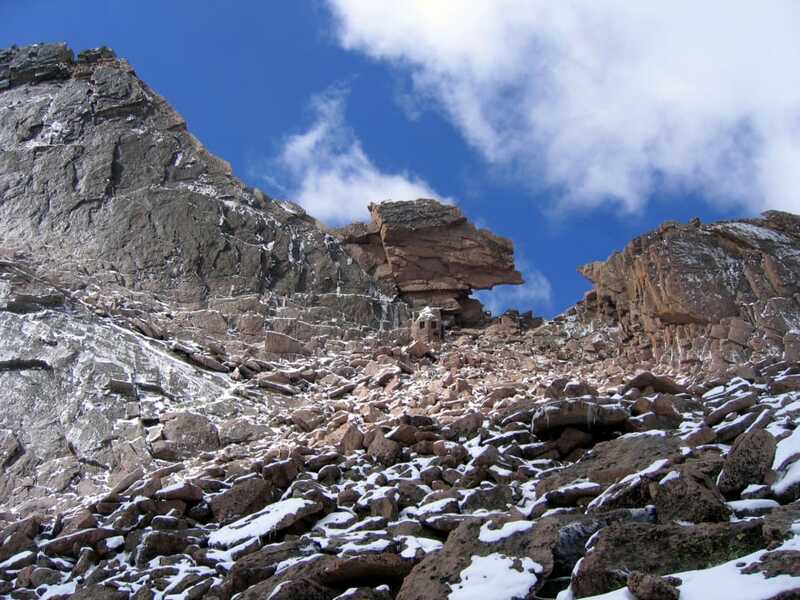 A common mistake many aspiring Colorado hikers make is to target Longs Peak before they have the fitness or experience to stack the odds of a successful summit in their favor. Here’s where Mount Bierstadt comes into play. 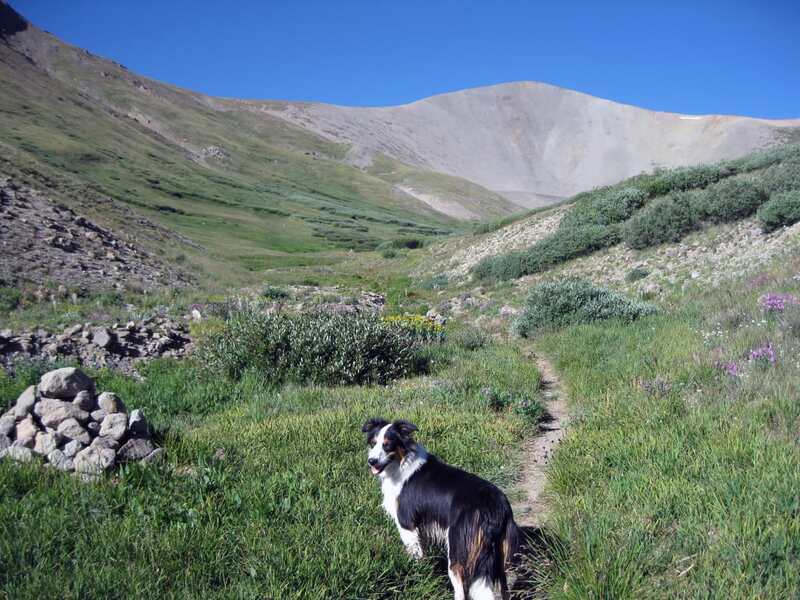 The popular 14,060’ peak off of Guanella Pass near Georgetown is an accommodating 6-mile round trip along a well-maintained trail. It’s a great starter mountain for those hoping to hike all of Colorado’s 58 14,000’ summits (the eponymous 14ers). 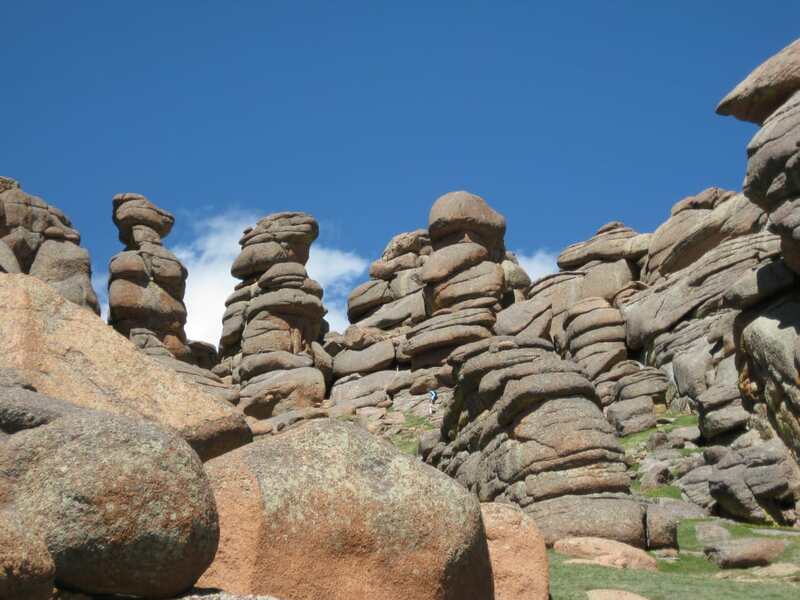 More experienced hikers can test their mettle on Sawtooth Ridge, a 1-mile stretch of Class 3 rock that connects the summit of Bierstadt with the shoulder of 13,842’ Mount Spaulding and eventually 14,264’ Mount Evans. The typical descent back to Guanella Pass involves bushwhacking through moose-infested swampland, where 7-foot tall willows create a natural garden maze. Lizard Head Peak is one of the toughest 13,000’ mountains in Colorado to summit, thanks to the chossy, loose, 400’ vertical tower that requires 5.8-graded climbing on poor rock to reach its highest point. Thankfully, this hike follows a good trail 3.5 miles one-way to the base of the tower—no climbing required. The adventure begins atop the paved Lizard Head Pass, about 15 minutes from the town of Telluride. Though it’s a 7-mile out-and-back, the trail starts off nearly flat as it wanders through alternating alpine meadows and pockets of pine forest. As views open up, the grandeur of the San Juan Mountains unveils itself, including the impressive profiles of the Wilson Massif. Standing at the base of the crumbling tower (an extinct volcanic pipe) makes the fact that it was originally climbed in 1920 even more impressive. 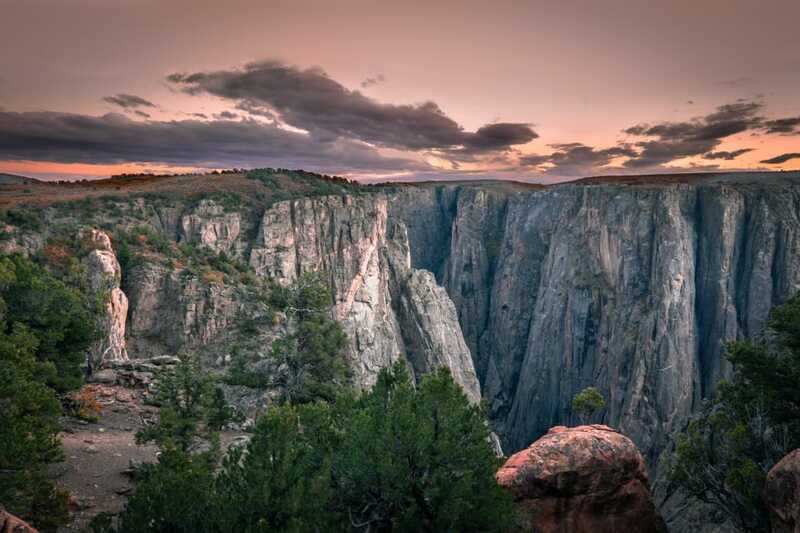 Black Canyon of the Gunnison, an oft-overlooked national park, flips the script by bringing you down rather than up. Oh, and the “trails” are more like suggested scrambles rather than fully developed hiking paths. The easiest of these is the Class 3 Gunnison Route, a vague idea of a trail that has an 80-foot section with a handheld chain for support. It drops down 1,800’ in one mile, so what it lacks in total distance it makes up for in thrilling scrambling. Rivers flow deep along the canyon floor, a shadowy place where the towering walls feel like the entrance to the netherworld. Wandering the canyon base is so marvelously unique for Colorado, it deserves a visit for adventurous hikers who aren’t afraid to get a little dirty on the way down. 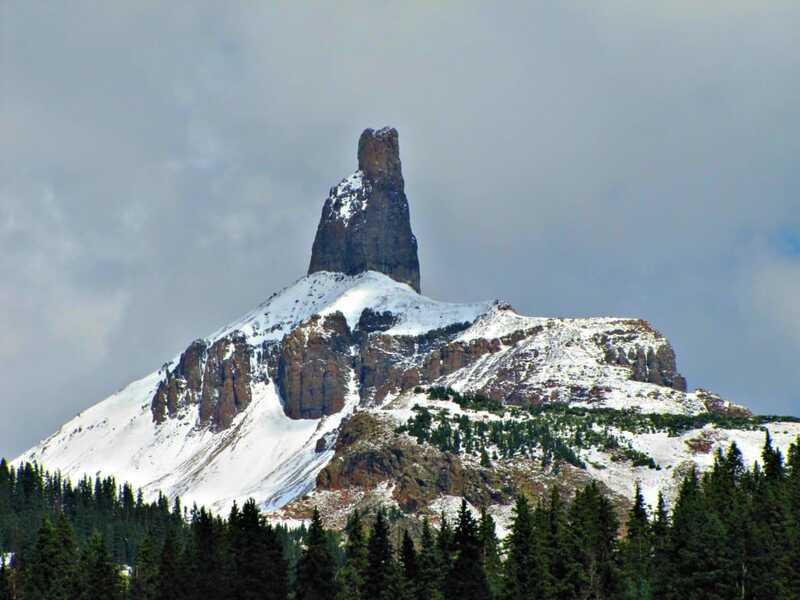 At 12,431 feet, Bison Peak is a collection of spectacular rock towers built up from a flower-festooned alpine meadow. The Class 1 hiking trail is 11 miles out-and-back starting near the Tarryall Reservoir in the Tarryall Mountains. The gradual hike up to treeline tends to go quickly, and it can get hot and dry in the summer—bring extra water! Cresting treeline opens up views of the wobbly, blocky, stone towers, some of which are over 150’ tall and seemingly transported from the Moab desert. Thankfully, the summit is a half-mile hike off the main trail across grassy meadows with a few easy hills or rock scrambles to the top. Once a bit of a secret, this unique peak has gained popularity in recent years, but is nonetheless rarely ever crowded. 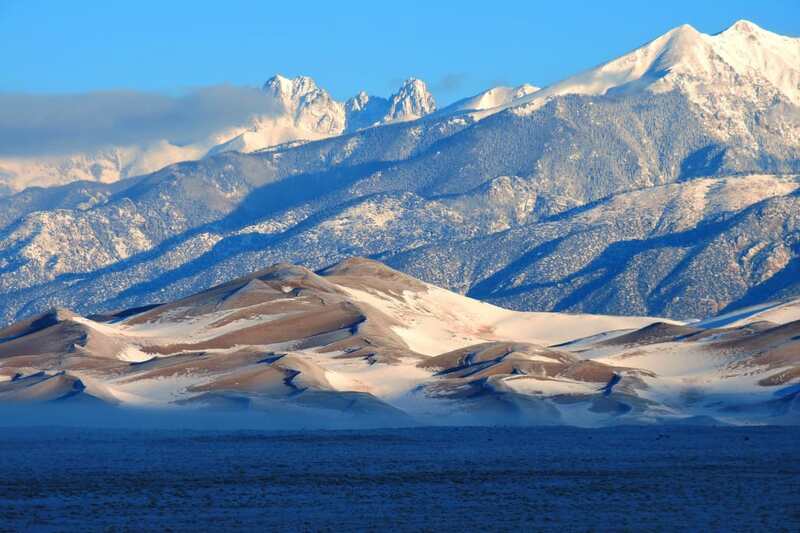 While most of the hikes in this list ascend mountains, it would be folly to ignore the fun, open-ended hiking at Great Sand Dunes National Park (especially from October-May, when the park is much cooler than in the summer). Star Dune is the largest of them all, standing at about 700 feet. In the early spring when the rivers run through the fine sand basin, the landscape transforms into a living, breathing desert in a compact package. Above the dunes stand the Sangre de Cristo Peaks, many towering over 13,000’. Wandering among the dunes can be as long or as short as you like it to be—consider it your own personal sandbox. The Lion Lakes are a chain of high alpine pools in the cirque between 13,310’ Mount Alice and 13,579’ Chiefs Head Peak in Rocky Mountain National Park. Accessed by the less-crowded Wild Basin Trailhead, this 12 mile out-and-back is mostly on the shared Thunder Lake Trail (itself a fine destination) before eventually splitting off and fading into one of Colorado’s most exquisite backcountry basins. Though the trail eventually fades out, navigation is relatively easy: follow the lakes and connecting streams and waterfalls up to the next tier. Wildflowers abound and the pristine meadows have all the elegant natural charm of Rocky Mountain National Park’s best settings—minus the crowds. Don’t let the high mileage fool you, most of the trail is smooth, flat, and easy to cruise. Pyramid Peak (14,018’) near Aspen is the most difficult day hike on this list—even more so than Longs Peak. While most hikers tackle the Class 3 (or Class 4, in some opinions) without any technical gear, it’s not unheard of to bring along a rope and harnesses. With good route finding, however, the standard route will stay at a tricky but solid Class 3. Most hikers start in the blackness of early morning (3 am is a reasonable start time), chugging up a steep headwall to an exciting scramble to the top (roughly a mile). Mountain goats are regular spectators, and the rock is solid for Elk Range terrain, especially in contrast to the neighboring Maroon Bells. Views from the flat summit look out over the aforementioned Maroon Bells and several other impressive Elk Range Peaks. The round trip is about 8.2 miles, but even strong hikers should give this one 8-10 hours. And bring a helmet! 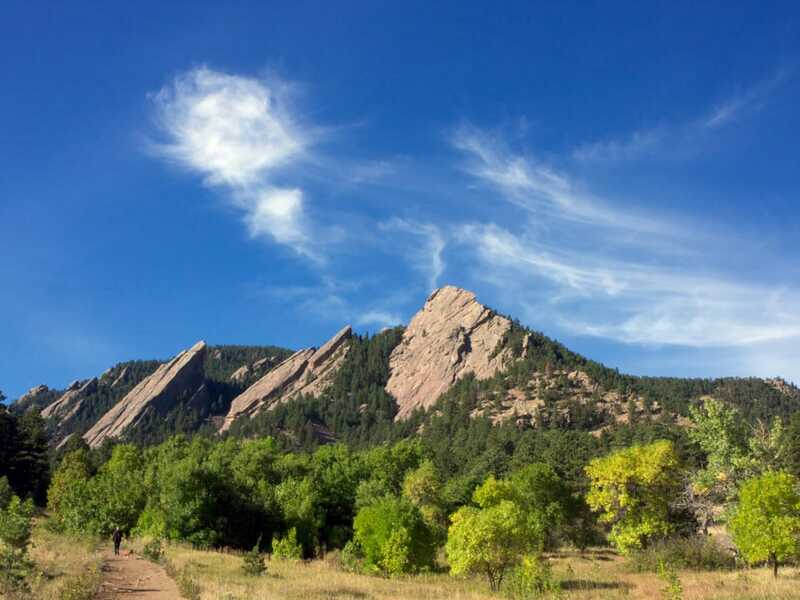 The trio of peaks that stand over Boulder’s iconic Flatirons make for an excellent day hike, which can be done as a loop or a point to point (approximately 12 or 10 miles respectively). Hikers can start at several different trailheads, all within the civilized confines of the city of Boulder. A popular route starts at Gregory Canyon Trailhead near Chautauqua and begins by ascending 3.2 miles to 8,150’ Green Mountain. Next, drop down to the Green-Bear Trail to the West Ridge of Bear Peak and ascend to the 8,460’ summit, where exposed, iron-rich rock offers the best 360 degree views along the traverse. On a clear day, one can see from Denver to Longs Peak to Pikes Peak. 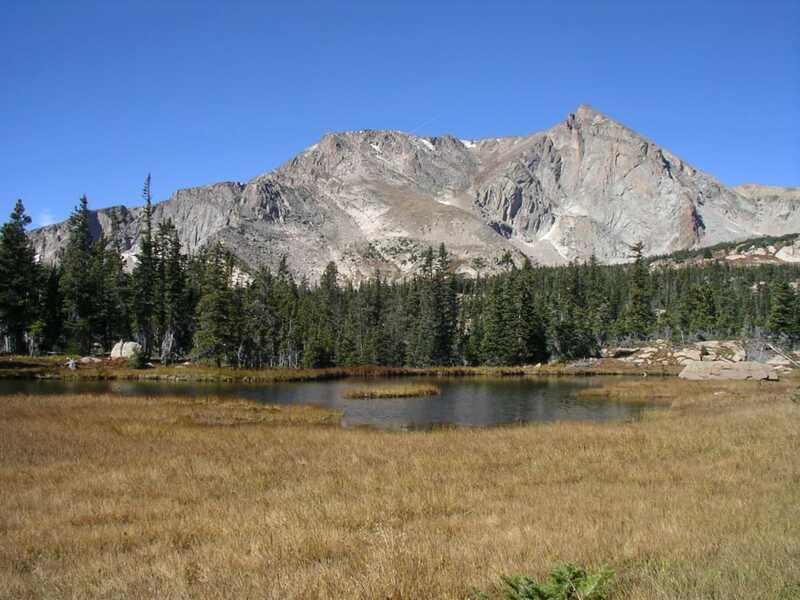 The highest and least-visited of the mountains is 8,549’ South Boulder Peak, whose boulder-adorned summit has great views to the west but is obstructed by trees to the east. Return via the Mesa Trail at the foot of the mountains back to Gregory Canyon or make it a point-to-point by leaving a second vehicle at the South Mesa Trailhead. Editor's Note: Parts of the Mesa Trail/Bear Canyon will be closed for trail work on weekdays May-September 2017. The trails will be open on weekends. 14,014’ San Luis Peak is a nice, long day hike (13.5 miles from the Stewart Creek Trailhead) through one of Colorado’s most vibrant basins. The gradually ascending trail is mellow, Class 1 terrain that starts in a piney forest, passes ponds and pools, and eventually opens up to large meadows with trickling streams, dense beds of colorful flowers, and wide-open views. It’s rarely crowded, despite being one of the 14ers, and the rocky trail at the top is welcoming and easy to follow. Views are understandably incredible, partially due to the relatively remote location of this San Juan mountain Very little manmade evidence is seen from the summit. It’s not technical, it’s not burly, but it sure is lovely. The trailhead for Lost Man Pass / Lost Man Lake is one mile west of the summit of Independence Pass. It’s easy to find, but note that the road is usually only open from late May to early October when snows close it down. This hike is roughly 7 miles out-and-back (depending on how much wandering you do around the lake itself) and follows the Lost Man Loop Trail through a rocky, rugged, basin. The chunky glacial rock debris is offset by serene lakes on the south side of Lost Man Pass, most notably Independence Lake. Keep hiking up Lost Man Pass up to 12,850’, where the dark, inky waters of Lost Man Lake reveal themselves on the north side. It’s a great place to have a mountain picnic or a chilly dip. Peak baggers have a lot of options in the area, including 13,301’ Geissler Mountain’s rolling ridges and 13,711’ Twining Peak. 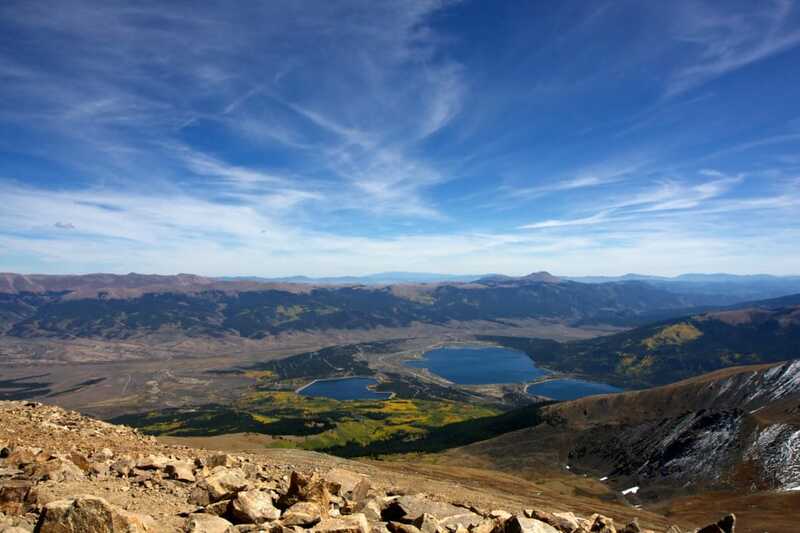 Colorado’s highest peak (and the highest in the entire Rocky Mountain Chain) stands at 14,433’ but luckily it’s a friendly hike via its standard route, the Mount Elbert Trail. This 9 mile out-and-back follows a solid trail from forest to treeline, where hikers get acquainted with the thin air and the possible heartbreak of a pair of false summits. Fear not, the actual summit is not far past the second false summit, and the wide, flat apex has a collection of wide shelters. There is very little exposure along the way, though the views of the town of Leadville and the Sawatch Range are mighty impressive. Worth noting: Colorado’s second highest peak, 14,420’ Mount Massive is just across the street from the Mount Elbert Trailhead. The duo make a nice two-pack punch for an ambitious weekend. 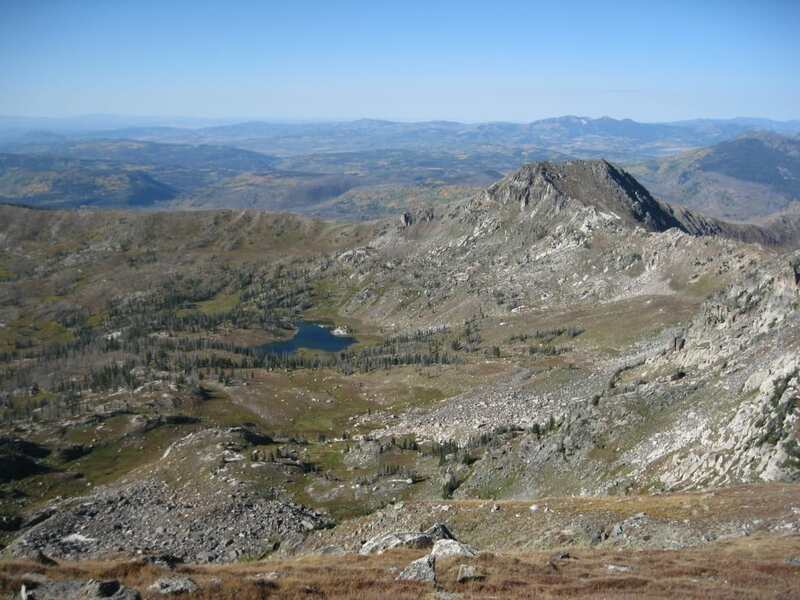 The roughly 3.8 mile hike (7.6 mile round trip) to Mica Lake starts from the Slavonia Trailhead near Steamboat Springs and is a wonderful introduction to the Park Range. 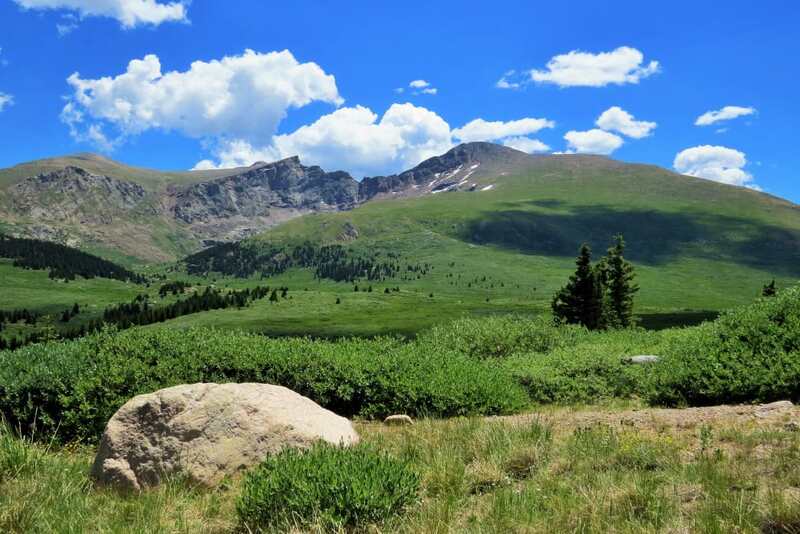 The Zirkel Wilderness is one of the lushest mountain regions in Colorado thanks to its northern location and relatively low elevation. The same storms that keep the rivers flowing provide the ski area’s legendary winter powder. As a result, the area is rich with flowers, flora, and colorful grasses and willows. Mica Lake is a small, greenish blue pool that is a favorite with canines. Nearby summits can be hiked or scrambled up including Little Agnes Peak, a second Little Agnes Peak, Big Agnes Peak, and a scenic point between them not officially named but locally known as “Middle Agnes Peak”. Mica Basin is one of the best autumn day hikes thanks to the variety of colorful foliage. Argentine Pass connects two basins, one accessed from Guanella Pass near Georgetown and a second accessed from the tiny mountain town of Montezuma near Keystone Resort. Both access points require a little 4x4 action to reach (stock SUVs should do fine either way). The eastern approach from Guanella has a parking area at the mining ghost town of Waldorf, where a battered building that once housed the post office still stands. From here, a walk up to the 13,207’ pass is roughly 2 miles one-way up a 4x4 road (dedicated 4x4 vehicles can drive to the top of the pass). From the the Montezuma side, hikers take a 2.5 mile trail up from the less-developed Horseshoe Basin to the pass. From the top of the pass, peak baggers can carry on to grab 13,738’ Argentine Peak to the South or 13,850’ Mount Edwards to the north. An ambitious point-to-point with two cars offers a chance to grab the nearby 14ers, Grays and Torreys Peaks, with a descent to the popular Stevens Gulch Trailhead. 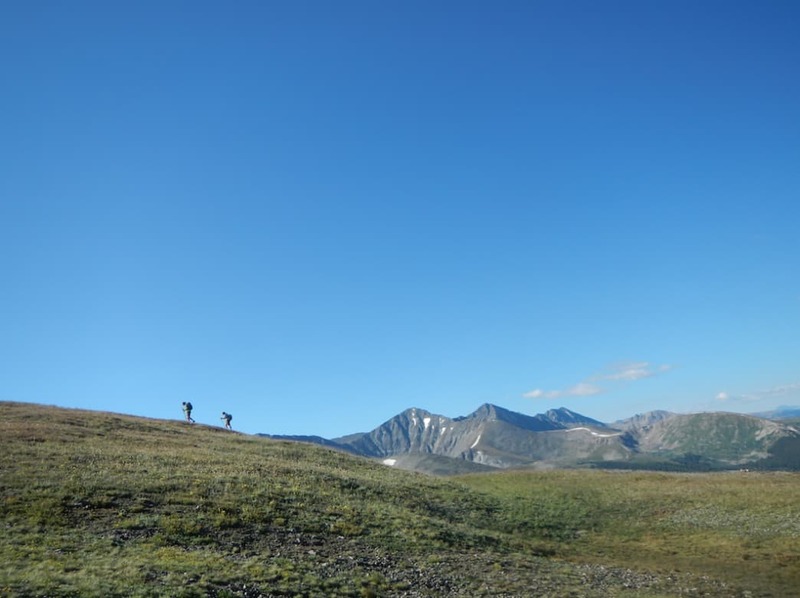 The Tenmile Range is home to the Breckenridge Ski Area, but this lesser-known hike begins from the overflow parking area of Copper Mountain at the Colorado Trail trailhead. This beautiful section of the Colorado Trail ascends through a shady forest before emerging from treeline in roughly 3 miles to vast, open, mountain meadows and stellar views of Copper Mountain to the west and the town of Breckenridge to the east. It is easy to get off trail and walk along the gently rounded hills to gain the ridge between Peaks 6 and 5 and take in the views—the Gore Range to the far west is notable. This is a great trail for a more casual day with friends and dogs, as it never gets too steep and the rewards are well worth the 7 mile round trip. 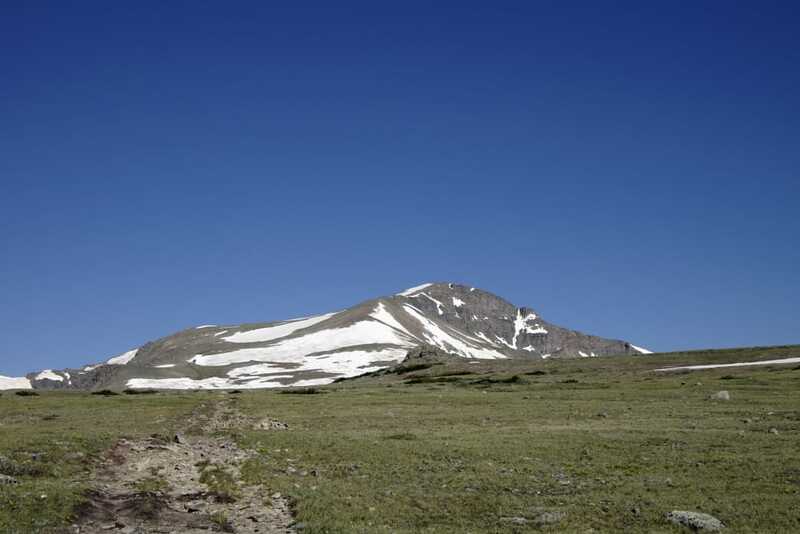 Ambitious hikers can traverse along the ridge north or south if they want more summits or if they want to explore the Breck Ski hills in the offseason. 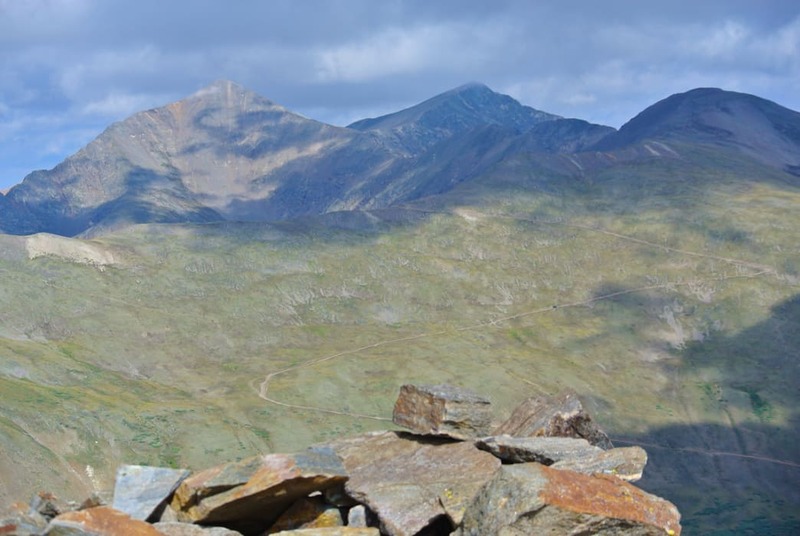 Strong hikers who want a unique point-to-point can traverse past Peak 10 to Crystal Peak and descend all the way to Mayflower Gulch parking area—an adventure that snags 6 named mountains! If the Spinner of All Lies has affixed his name to a geological feature, you know it’s going to be interesting. 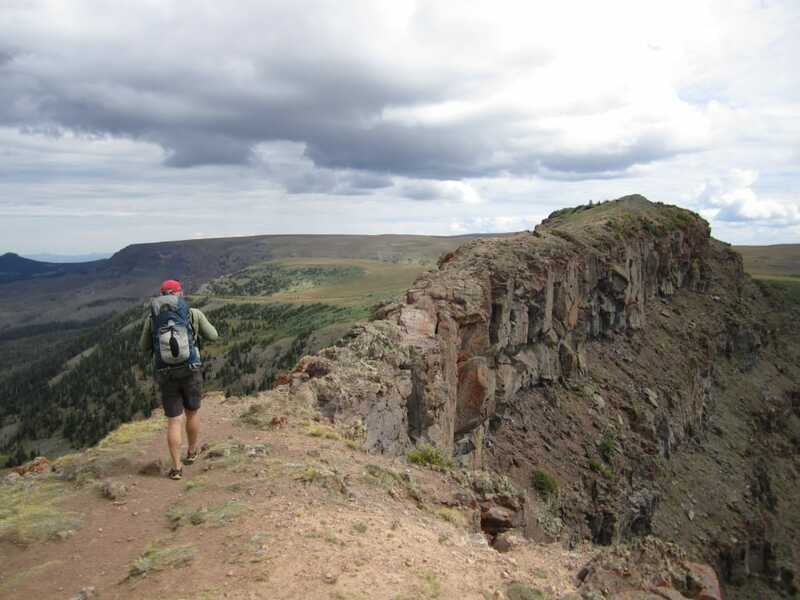 The Devil’s Causeway sits in the Flattop Wilderness, an isolated patch of mountains that are accessed from the town of Yampa between I-70 and Steamboat Springs. The hike itself is a nice, 6 mile round trip starting from the East Fork Trail. The namesake feature is a non-technical but heady 50-foot stretch of rock that narrows to 3 feet wide and has drops of 60-80 feet off either side. Depending on your reaction to exposure, this is either a neat walk along a solid spine of rock or a belly-crawling, sphincter-clenching ordeal—or maybe somewhere in between. 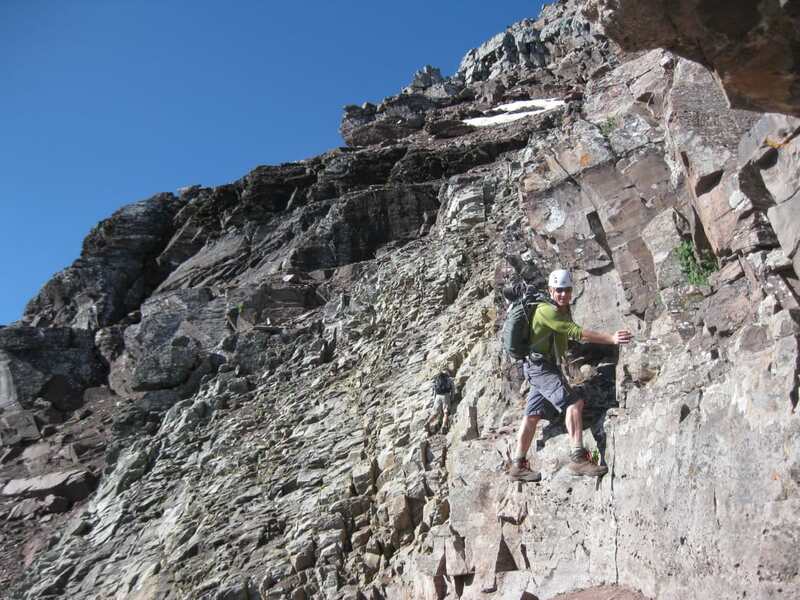 Even if you opt out of the traverse, a visit to the Flattops is worth the time, as it’s one of Colorado’s less-known mountain areas, and the rock walls and tabled-off summits are quite spectacular. 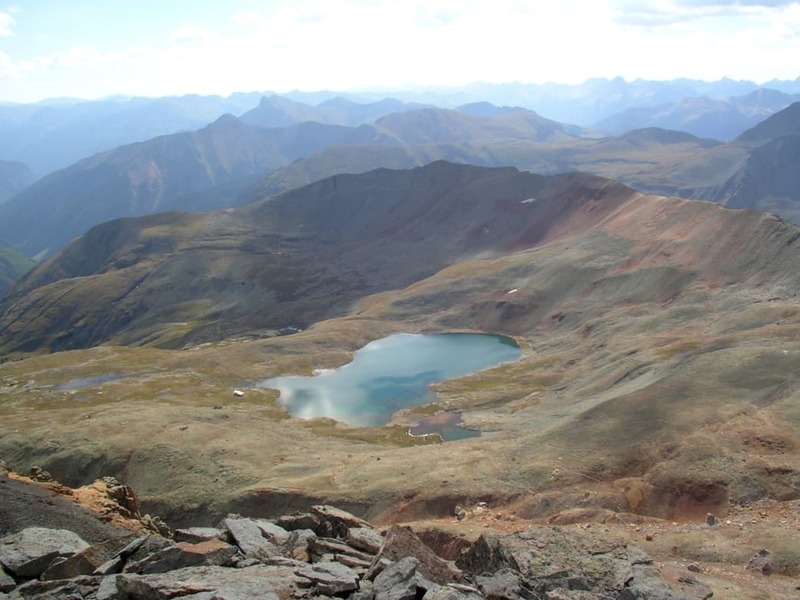 Silverton is known for spectacular mountain scenery, and Ice Lakes Basin out of South Mineral Campground offers a snapshot of what makes the San Juan range in southwest Colorado so special. This 7-mile round trip follows a steep but steady trail through the forest to a series of shimmering, blue alpine lakes, including Island Lake. Creeks cascade through the green valleys and roll over rounded rock walls, painting them a mixture of green, black, and grey. The imposing “sinking ship” profile of 13,780’ Golden Horn dominates the skyline—from the perspective of the lakes, it’s hard to believe this cracked and crumbling peak is only a Class 2 scramble! Nearby Pilot Knob, 13,738’, is a shattered comb of rock that is rarely climbed (and usually just by mountaineers knocking off Colorado’s 200 highest mountains; Pilot Knob is the 131st highest). There are also smatterings of mine and cabin ruins at the upper lakes, a testament to the area’s mining history. The La Plata Mountains can be found in southern Colorado and are normally accessed from the small town of Mancos. The Sharkstooth Trail is an excellent way to tour this lonely chain of distinct peaks. Starting from the Sharkstooth Trailhead, a hike up to 12,000’ Sharkstooth Pass and back (4 miles round trip) may satisfy your mountain cravings. From the start you’ll see the remarkable alternating red and white stripes of 13,232’ Hesperus Mountain, one of the four sacred Navajo mountains. Approaching Sharkstooth Pass, the namesake 12,462’ Sharkstooth Peak juts out from an ocean of talus rock, but the trail remains easy to follow with good footing. Those looking for a bigger day can traverse the basin on the east side of the pass 2.7 miles to the next pass, where the Colorado/Highline Trail continues to the north above Cumberland Basin. The Colorado Plateau in Mesa County is home to McInnis Canyons, an area many Coloradans have no idea exists. 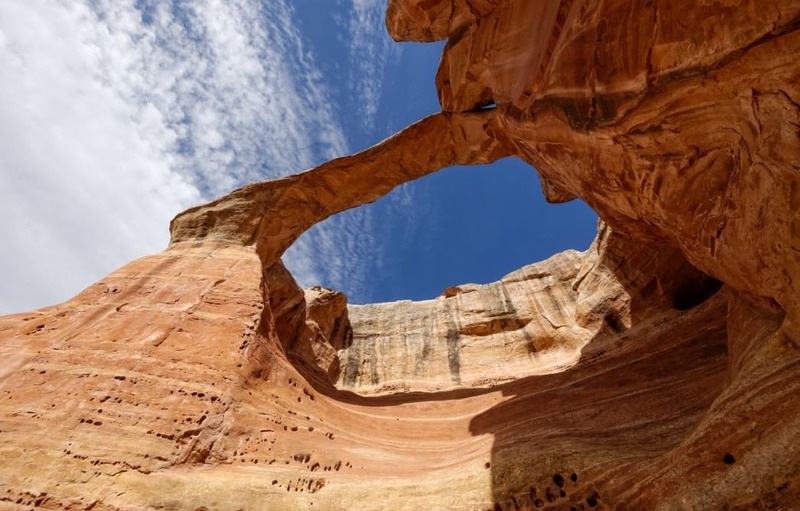 This spectacular desert playground has the second highest concentration of natural sandstone arches in the world—only nearby Arches National Park has more. There is a lot of open terrain to explore, but a tour on the Rattlesnake Arches Trail (starting from Black Ridge Road) is the best way to take it all in. The arches here resemble prehistoric fossils, pockmarked and elegantly curved. A full out-and-back is about 7 miles, though most hikers detour and explore the many formations along the trails. Crowds are low and the landscape is incredible, so take your time as you walk among these natural wonders. Finally, we come to the tastefully named James Peak. This 13,301’ summit is a nice walk-up that is 8 miles round trip as an out-and-back. The appeal of the mountain isn’t just its proximity to the Denver/Boulder metro area—its standard route also ascends one of Colorado’s last remaining glaciers, the St. Marys Glacier. The glacier (which has been downgraded as a “semi-permanent snowfield”) is safe for foot travel, as it lacks deep crevasses. A tiny ski area once operated year-round on the glacier from 1930-1986, and the remains of the ski lift can be seen on the way up to the trailhead parking. Above the glacier, the approach to James crosses a long, flat section before ascending up a Class 2 trail along the rounded slopes. Views from the top look out into the Winter Park ski area to the west, the Indian Peaks to the north, and the Front Range to the south. Written by James Dziezynski for RootsRated.